Adrian Flux are proud to be associated with the Jaguar Enthusiasts Club, and are pleased to be able to offer JEC members substantial discounts on all car, motorcycle and home insurance purchased. Plus you'll have the added satisfaction in knowing that the club benefits from your purchases too. All this is possible, because we know that Jaguar drivers and enthusiasts are much less likely to make a claim than the average driver, and so we've been able to create special schemes that reward safe Jaguar drivers like you. At Adrian Flux we have a long history of offering Jaguar car insurance to our customers, covering both classic and modern Jaguars. 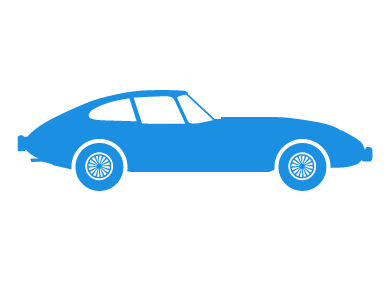 With specially designed schemes for both classic cars and prestige cars, we can offer a high quality Jaguar car insurance policy, whether you drive a vintage SS, a sporty Jaguar XK8 or even the latest Jaguar XF. Get a great Jaguar insurance quote now. Jaguar drivers are often penalised by insurance companies, and may not even know it. The problem is that all Jaguar cars are relatively powerful, and so treated as performance cars by mainstream insurance companies. This results in high premiums being quoted for Jaguar car insurance, as the computer rates will fail to take into account the distinctive qualities of the typical Jaguar driver. Classic Jaguar insurance presents a different set of problems. Often, the insurance company may not have an idea of the true value of the car, and so you may find that you policy does not cover your car for it's true worth, even when you get an agreed value. That's one of the reasons why our agreed values for Jaguars utilise the expertise of the Jaguar Enthusiasts Club, which gives you the peace of mind that you'll be covered for the true value of the car, no matter what. At Adrian Flux, we take the approach that people who buy a Jaguar will typically look after it in a very protective way. We know that your Jaguar may be a cherished or classic vehicle, and not used as a runabout. And because we know this and also offer great deals for the true enthusiast, we can offer you superior Jaguar car insurance at incredibly low prices. Our highly trained insurance experts have access to a huge variety of schemes - hundreds, in fact. Because we can quote on such a wide range of car insurance, and because all our schemes are designed with our customer foremost in our mind, we are confident we can offer you a jaguar insurance policy that's just right for you. Our staff deal with unusual situations every day, so, unlike most of our competitors, they aren't constrained by computer rates - they also know which insurers offer the best Jaguar insurance policies with prices to fit your budget. When you call Adrian Flux you will be speaking to a fully clued up enthusiast, based in the UK, and with our tailor made Jaguar car insurance schemes, we believe we offer the best Jaguar insurance quotation service around. Quicker & Cheaper Jaguar Car Insurance rates over the phone - call the bespoke JEC Insurance line on 0800 089 0336 or complete the call me form during office hours (9am to 7pm Monday to Friday & 9am to 4pm Saturday) for an immediate, no-obligation Jaguar insurance quote. ** Sample quotes are for fully comprehensive premiums for a male driver with a clean license and full No Claims Bonus (unless stated otherwise). These illustrative quotes, valid as at 13/07/2006, are provided for information only and do not form the basis of any contract or tender.